If the hostel is not informed of any cancellations a minimum of 3 days before the arrival date, customers will be charged the equivalent of one nights stay on their credit card. This is a tourist hostel and as such we do not accept bookings by local residents. Please note that we only accept guests between the ages of 14 and 40 years old. WINNER OF THE 2016 HOSCAR AWARD FOR THE MOST POPULAR HOSTEL IN TURKEY! All rooms are fully air-conditioned, free wi-fi, 24 hours heating and hot water! Bahaus Guesthouse hostel is the winner of the 2016 award of excellence by Trip advisor. Bahaus Guesthouse hostel is also the winner of the 2015 award of excellence by Trip advisor. Bahaus Guesthouse hostel is the first and only hostel in Turkey to be voted number one worldwide by Hostels.com for Sept 2005. Also voted in the top 10 hostels worldwide by hostel world for May 2006, Jan 2006, April 2006, June 2006, July 2006, Aug 2006, and Feb 2010. The only hostel in Turkey to be chosen in the top 12 good hostels for big-city stays worldwide by several international newspapers, including the Washington Post, Salt Lake Tribune, Deseret News and Ottowa Citizens (Aug 2006). Bahaus is currently recommended by Lonely Planet, Let's Go, The Rough Guide, Routard, Trotamundos and Trotter guidebooks. All our rooms are fully air- conditioned; rooms also have overhead ceiling fans for guests who don’t like air-conditioning. We have charming dorm rooms, equipped for a comfortable sleep with privacy curtains, bedding, orthopaedic mattresses, central heating, free large security lockers (bring your own padlock). Our comfortable double (ensuite/ shared bathroom) and twin rooms (ensuite/shared) have their own lcd tvs and security boxes. Room rates include clean sheets, duvet, duvet covers and pillow. The all new bathrooms have24 hour hot water, large waterfall shower heads, foam dispensers, hygienic toilet seat covers, hair driers. Safety is a priority. We have security cameras at key locations and 24-hour reception, while our dorm rooms have security card password locks. Travelling alone or in a group, there are plenty of opportunities to socialize. Enjoy a delicious barbecue on our spectacular roof top terrace. Play backgammon, poker, smoke a hookah, listen to music or just admire the breath-taking view over the Marmara sea and Asian side of Istanbul. We are a sociable and party-loving hostel- we hope you are social too! We have free internet access on several computers as well as free wi fi throughout our hostel. Our staff are genuinely friendly and want to help. We have a free travel advisory and know just what you need to have the best holiday ever! We offer an airport pick up and drop off service as well as a 24 hour wake-up service. We are waiting to give you the warmest welcome to Istanbul. Every day we have a delicious, free breakfast which includes cheese, olives, salami, eggs, jams, butter, bread, chocolate spread, tomato, cucumber, yoghurt, milk, cornflakes, dried fruits and on certain days we also serve special Turkish omelette, pies and cake. On some nights, we have free movies, karaoke, belly dance shows and pub crawls (free entrance only). In fact, we have loads of free facilities including free local phone calls (landlines only), security lockers, car and bike parking, city maps and a book exchange. Bahaus hostel also has opened a unique resort hostel in Dalyan, located on the Mediterranean coast in an environmentally protected area - chosen the Best Open Space in Europe (The Times), in the top 10 best beaches in Europe (the independent), the best beach in Europe (dutch media). With an adjacent organic farm, swimming pool, jacuzzi, fully-equipped sports salon, pool tables and so much more. All types of tours can easily be arranged (blue cruise, white water rafting, jeep safari, historical etc.) As well as to nearby Pamukkale, Fethiye, Mamaris, Ephesus as well as blue cruise. Ask at reception for more details. There is no curfew and no lockout! One of, if not the best hostel I've stayed in. The location is superb (right next to the Blue Mosque and Hagia Sofia), the beds are great, the security is tight but most of all the atmosphere can't be beat. The staff are all superb and always friendly, funny and welcoming. Big shout out to Murat, Tugi and Irmak - quality staff. Great hostel, lovely staff, nice location, friendly people and comfortable beds! No complaints! Amazing Hostel, staff was very knowledgeable and friendly. Amazing location as well. Probably the best place to stay in Istanbul. The Staff is great. I highly recommend this place. Very accommodating staff. Great location as it’s situated near most of the sight-seeing locations. I would also like to commend how easy it was to extend my stay for another night without any complications. Awesome hostel located in the heart of old town Istanbul. Only 5 minutes walk to Hagia Sofia and Blue mosque. Great and helpful staff. They have one of the best hostel breakfast I've ever had including coffee/juice, bread, fruit, eggs, olives, and meat. Awesome rooftop view with a bar. They had pub crawls every other night but I didn't go because they start very late. Rooms were spacious and each bed had a private curtain. I can't recommend this hostel enough. 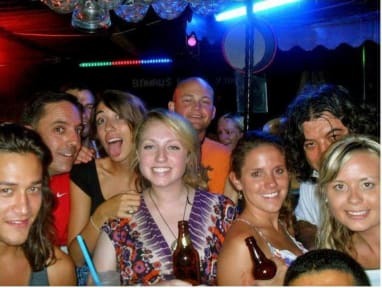 I was a solo female traveler from the US (VERY few in Turkey FYI) and wanted a “party” hostel. This was in the middle of a very touristy location (which is good for safety but also annoying with the amount of street vendors trying to lure you into their shops). Staff was really friendly, 4 bed female dorm was clean and well worth the price. The roof is awesome. There weren’t many people when I was there, so it wasn’t very social. I stayed at Cheers for one night and that had more people. I only stayed 2 nights in a 4-bed female dorm. Since it was off-season and mid-week, it was quite quiet (none of the partying as you see in the pics), but that was probably just because of timing. The hostel is clean, staff are mostly super friendly and helpful, and it was nice and quiet in my room at night. Plus - it's super close to Sultanahmet, which is a great base point for exploring the city.